The Blue whale is the largest of all whales and most notably is the largest animal on earth today, possibly the largest animal ever to live on Earth. 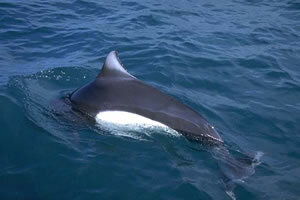 The Dall's porpoise is easily identified by it's very unique black and white markings and is named for the naturalist who first discovered them, W.H. Dall. They are mostly black on the upper body with large, oval shaped white sides and bellies. The head is rounded and small while the body is muscular and powerfully built. The colorations vary with geographic regions as well as the stage of life. Adults have more distinct coloration. The Dall's porpoise is definitely the fastest swimmer in the small cetacean category with speeds of 34 miles per hour (30 knots) being reported. They are attracted by fast moving vessels and love to dash at high speeds often seen bowriding alongside. This fast swimming creates a rooster tail of water spray which is unique to the Dall's porpoise. We've personally enjoyed watching them swim along side our boat in Resurrection Bay in Seward Alaska as well as alongside our cruise ship in the Inside Passage. These fun-loving playful porpoises can only be found in the North Pacific Ocean where they prefer cooler water temperatures between 36 and 60 degrees (2C-15C). Many are year round residents of their region. These regions range from up north in the Bering Sea and Alaska to as far south at Baja California and as far east as the Sea of Japan. Their small, narrow mouth has about 20 small teeth in each side of the upper and about 22 teeth on each side of the lower jaw. Protruding, rigid growths separate each tooth often called “gum teeth”. These small teeth and horny growths help the porpoise grasp slippery food such as squid. The Dall porpoise feeds mostly at night eating about 30 pounds of food each day. Their diet varies depending on what's available, such as squid and small schooling fish like herring, capelin and sardines. They have also been seen feeding in the deep waters of the Pacific ocean on deep-sea smelt and lantern fish. They congregate in groups of as many as 200 during feeding times but usually travel in smaller groups of 10 to 20. 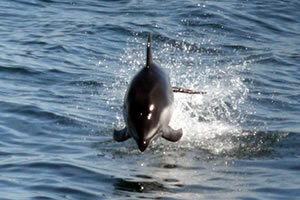 If you look close they can often be spotted swimming with Pacific white-sided dolphins or pilot whales. Length: 6-7 feet for males and females with a maximum length of 8 feet. Weight: Average 270 pounds for both males and females. Travel speeds: up 30 knots. Habitat: Found only in the North Pacific, ranging from Baja California to Alaska and the Bering Sea and over to Japanese waters. Diet: Squid, herring, sardines, capelin, deep-sea smelt and lantern fish. Webmasters, Add A Link To Us. <strong><a href="http://www.whale-watching-alaska.com/whale/dallsporpoise.html">Alaska Dall's Porpoise</a></strong>: Explore the watery world of the Dall's Porpoise found in Alaska! Information about the location, strength, and overall health of the species in Alaska. All images on this page are created by Whales of Alaska, the design team editors for this site. Please use images freely without alteration, and check back for updates. If you have any suggestions for us, or if you need an image with different dimensions than those offered here, please contact Bob Jameson or the Whales of Alaska Web Team with details.